I like green things; money and grass are two things that spring to mind and I'm a big fan of Joomla themes too and the new theme from Joomla Bamboo is aimed at that type of website. When it comes to my office and my website though, I'm not green and whenever I see that little mark at the bottom of the email saying 'think before you print', I print. Joomla Bamboo say it best when talking about this new theme, so I'm going to quote them. It feels appropriate. 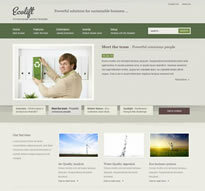 The Ecolift theme is an "elegant environmental theme with soft grunge elements combined with an organic crafty feel. Its the perfect template for creative artists, green businesses or even handmade arts and crafts websites." I like it, but I am starting to like more and more themes these days, because they are offering the flexibility you want when creating a website and gone are the days where you have to have all your content on the homepage. These days - you can buy one of these themes, plug it in, open up Fireworks or in the case of Joomla Bamboo, Photoshop (come on guys please), make your necessary changes to the images and bish bash bosh, you have a website that nobody has seen before. You really will like this site and it does look professional. Click here for a demo or to join the club. I'm not going on with the features. Go look for yourself .